The second volume of the Terra Ignota series completes Mycroft Canner’s history of the “days of transformation” begun in Too Like the Lightning. In 2454, the leaders of the great globe-spanning Hives, which have replaced geographic nations, have long conspired to keep the world stable, but that balance is beginning to give way. The secret of Mycroft Canner’s rampage lies open for exploitation. Police investigation has uncovered a massive, unsuspected crime. An urban center of depravity and political control has been revealed. The secret of the child Bridger’s supernaturality is spreading. A long-hidden warmonger has returned to harangue the populace in archaic style. 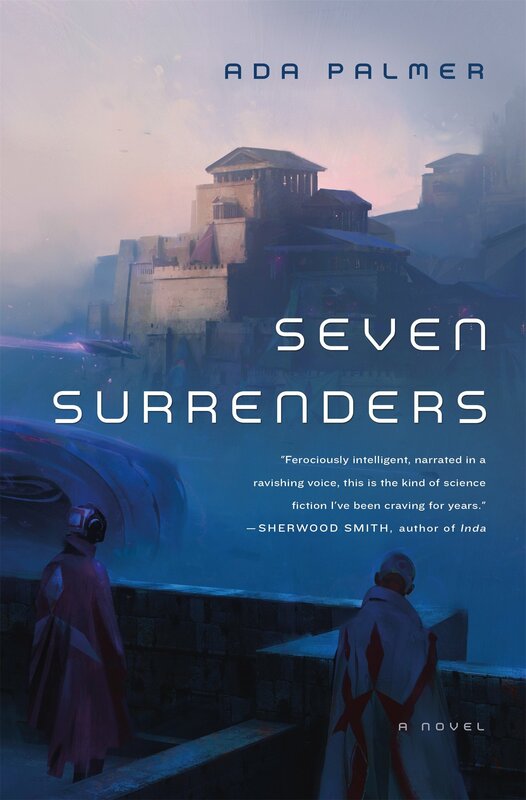 Shot through with astonishing invention, Seven Surrenders from Tor Books brings humanity beyond its long, peaceful near-Utopia to a new reality. Competition, assassination, kidnapping, fantasy, concealed arsenals, revealed Truth, and the lust for power and vengeance are spread before the eager Reader in Mycroft’s unique prose. The social structures, and social failures, seen in the first volume buckle under the onslaught of the ferocious purpose of determined world leaders and secret controllers, while the basic forces of nature are upended and the faith of billions is tested. Palmer’s second installment is as challenging a read as the first, though true lovers of debate and philosophy who want to tackle life’s biggest questions will feel rewarded for their efforts.